Summer storms are a sight to see (and hear), with brilliant flashes of lightning and loud booming thunderclaps that can sometimes shake whole buildings. Seriously—they’re no joke. And dogs and cats, like many people, often experience some anxiety over the loud sounds and bright flashes. Sometimes their fear is relatively minimal, and they feel better simply being in the same room as their owners. But there are some animals that are deeply afraid of the thunder and lightning—like my Chihuahua mix, Bella, who hides under a table, panting and shaking. When dogs are crate-trained, their crates are one of the areas in the home they feel safest and most comfortable. If Fido is crate trained, make sure his crate is open and add an extra blanket or favorite toy to make the spot even more comfortable. If your pet doesn’t have a crate, find a spot where you can put a comfy bed and let him hide for a bit. Having a corner to retreat to will go a long way toward easing a dog’s or cat’s anxiety—sometimes they just need to hide. It’s important to treat the storm like it isn’t a big deal. If you overly comfort and coddle your pet during the storm, he may pick up on that as unnatural and become even more anxious. That’s not to say that you should ignore or punish him—still give your pup positive attention, but act normally and continue doing whatever you’re doing, whether it’s washing the dishes or watching TV. Before a thunderstorm really gets underway, it can be helpful to start playing some soft and calming music. You don’t want to play anything too loud or intense, but something relaxing, like classical or smooth jazz, could act as a good distraction from the loud noises going on outside. Another great distraction technique? Play a game! Your pets love when you play games with them, so take the opportunity to bond a little. Use a feather wand to keep your kitty entertained, or favorite toy with your pup. This will show them that you aren’t worried and will keep their mind off of their fear. Chewing is a common reaction to fear for many dogs. Keep your pet from chewing inappropriately by giving him or her a toy they can bite on; provide a favorite toy, Nylabone, ball, or treat. A ThunderShirt is an adjustable, wearable item that applies a gentle, constant pressure that can ease your dog or cat’s anxiety. If your pet is usually uncomfortable in clothing items, this may not be a solution, but it has worked wonders on my dog, Bella! In addition to during storms, she wears her ThunderShirt on her least favorite day of the year: July 4th. If your dog or cat is young enough when you start noticing fear or anxiety during thunderstorms, there’s a good chance you can desensitize them to the sounds of thunder. Look online for thunderstorm sounds, and play them while you’re at home (don’t keep them on while you’re away—you’re an important comfort to your pet). Start playing the sounds softly and raise the volume over time until they stop reacting or you notice their anxiety lessening. If you feel like you’ve tried everything and your pet is still terrified of storms, you may want to check with a veterinarian or an animal behaviorist. A professional may have some advice for your specific case, or he or she may recommend trying medication. 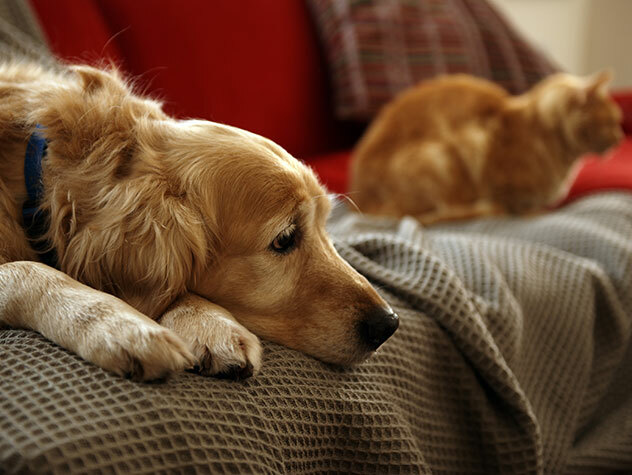 Remember that both dogs and cats are more likely to run away when they’re afraid or anxious, so keep your pet away from your door during thunderstorms.